Another 31 wins & 55 nominations. I thought Disney's Zootopia has reached an epoch in CGI, but The Jungle Book is definitely the crowned jewel. I was awestruck by the level of visual details of each animal that occupies the screen. The facial expressions mirroring its running gamut of emotions, the physical movements of each animal, the pitch-perfect voicing - who wouldn't believe they possess a human soul? Films using a predominance of CGI go stale very fast if the story cannot keep up. The seams will start to show and the minutes will turn to hours. Looking at all the frames of The Jungle Book, other than Neel Sethi as Mowgli, everything is CGI-ed to the Ying Yang. But the sense of story is so compelling, I was totally immersed in the world. Yes, animals can talk! I am a believer! Favreau marries the narrative and the visuals so well, I couldn't see one without the other. It is the perfect marriage - each element serving the other in a symbiotic relationship. 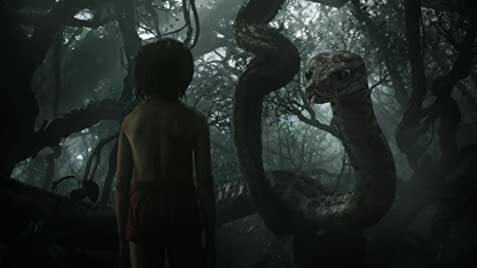 The sound design is also an aural extravaganza - just listen to the scene where the anaconda, voiced by Scarlett Johansson, engages and hypnotises Mowgli. The surround sound design is jaw-dropping oh la la. In fact, I think the entire movie is a demo disc for home theatres! This is one of the most satisfying movies I have seen this year. There is something here for everyone, from the kids to the adults. As much as I was totally captivated by the movie, I did make one snide remark (actually two, but I will keep the second one to myself). At a languid scene of Mowgli floating down the river with Baloo the bear, voiced by the incomparable Bill Murray, thick undergrowth starts to rustle and ominous music starts to reverberate. Mowgli and Baloo stare fearfully at the moving bushes, getting ready for impending danger as best as they can. I turned to the missus and whispered, "I think Leonardo DiCaprio is going to pop out." She laughed. This movie was released in India on April 8, a week ahead of its U.S. debut, to pay tribute to the Indian environment of the movie and novel. Bagheera: Many strange tales are told of this jungle, but none so strange as the tale of the cub we call Mowgli. When the primates kidnap Mowgli, some of the gibbons are shown walking on their feet and knuckles on all fours, similar to chimpanzees and gorillas. Gibbons do not actually walk on their knuckles, only their feet. The Disney castle logo shrinks into jungle foliage as the camera pulls back but the film title moves off-screen left as the camera adds pan right motion to its pullback, panning first to a Bambi scene and then to a jungle scene.